I’m almost afraid to ask Robert where he stuck this one, considering he’s already dedicated his torso to Slash of Guns ‘n Roses and all of his limbs to Batman tattoos and Buffy tattoos. Best left to our imagination, methinks. But if I had to put the visage of a bullet-riddled cybernetic organism anywhere… it would be right on the palm of my hand. That way, anybody getting my karate-stylin’ palm strike to the face would get a horrifying glimpse of the future before experiencing their own horrifying trip to the future. Yeah. That’s poetic justice, people. Or irony. I don’t remember, exactly. But certainly we can agree it’s awesome enough to deserve a term in a 10th-grade literature textbook. Hmm, what’s the visual equivalent of onomatopoeia? I think that’s an example of irony. Poetic justice would be if the recipient of said blow exclaimed something along the lines of, “I think people who get Arnold tats on their hands are too stupid to karate-chop me…” right before getting popped. Nathan: Nickolai is the visual equivalent of onomatopoeia. someone please tell me who did the tattoo. i’ve been sickly obessed with arnold for most of my life, and i’ve been waiting to get the perfect tattoo , and i think i just found it. i have 85% of my body done, and im just waiting on this. PLEASE PLEASE PLEASE email or tell me where this pic came from? artist name? shop name? anything will help! also, i’ll be willing to trade pics of my geeky tattoos for this website. take your pic, i have garbage pail kids, wheres waldo, little shop of horrors “audrey II”, freddy kreuger, and many many more. hook it up on the arnold info PLEASE!! 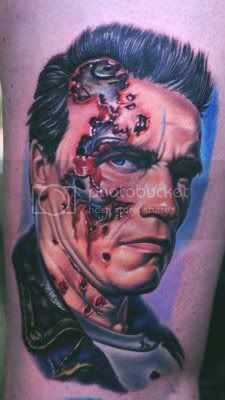 @priscilla: More than likely, the artist was Nikko Hurtado, who does most of Robert’s ink.